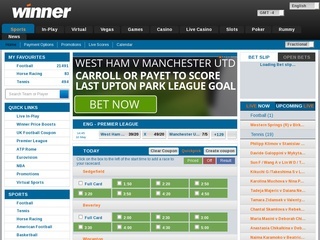 Winner Sports had started their online gambling service in 2009 when they launched their online casino. Years late in 2013 they used the same Playtech Software to launch their sports betting platform. The site is owned by Redfinger Trading Limited, and the gambling licenses are registered by Zirconium Gaming Limited. Winner sports are operating under the jurisdiction of Antigua and Barbuda. The site quickly became one of the most recognized bookies in the world and had been reviewed as one of the top 100 bookmakers in the world. To boost their brand popularity Winner became the official sponsors of West Ham United F.C. The company keeps introducing new markets and games to their platform trying to stay in touch with new trends and most popular betting events. Casino and poker games being their initial business, Winner are proud with their unique technology for live casino games which are filmed and broadcast from a real casino. According to them that is a way to transfer some of the atmosphere and the feel of the game. As like many other big names in the industry Winner Sports are also part of the international movement for responsible gaming and offer links to websites where help and support is offered for people with such conditions. The first time you enter the site you’ll be welcomed by a very clean and easy to understand interface. All the action you’re looking for is situated on top of the screen where you can find the Sports, Casino, Vegas, Bingo and Live Casino betting opportunities. Clicking on the Sports menu will take you to a vast selection of Sports events. You’ll find Football, Tennis and Horse Racing on top meaning they are the most played sports right now. Scrolling down will reveal that the site covers most of the popular sports, and even E-sports are available for betting. Special wagers can be placed on Politics and Entertainment events. One of the best features of the platform is the opportunity to bet on Live events. Football, tennis, cricket events and many more are available to bet on while they’re happening. The Casino section has most of the popular gambling games like Roulette, Slots, Blackjack and other interesting games. 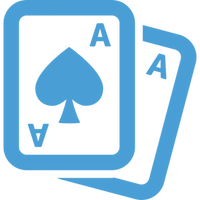 The Poker games are also heavily supported with weekly tournaments and freerolls available. Being a modern betting platform, Winner Sports have developed a mobile app for users who like to bet on the go. The betting slip functionality is also quite a nice feature that many other bookmakers do not have. You have a Standard and Bankers betting slip options where you can include every must bet permutation. Winner offers their players a really big selection of odds, especially for Football. There you often find more than 20 000 odds per day available with most of the famous wagers covered. For example, a match in the English Premiership will have about 120 markets every week. Match Result and Double Chance are available like many special bets on players, cards, corners and others. Everyone’s favorite Asian Handicap is also available which puts the bookmaker in front of many other big names in the industry. You have all odd formats supported, Fractional, Decimal and American. You can change them with just one click. To gain such popularity in just under three years, Winner made the effort to please their customers and support them in the best way they can. The site offers a secure SSL encryption that ensure all players data is protected. The platform offers six languages to choose from with English being the default one. Winner sports are part of the “Responsible gaming” movement where underage players are strictly forbidden. Also, they encourage users to play for fun and not make a living out of gambling. Customer support is excellent with many contact options available. Email, live chat, and a dedicated phone are available for customers 24/7. Response time is relatively fast depending on the contact method you choose. As a modern betting site, Winner has made their social media profiles in Twitter and Facebook another option for players to contact them. To make it easy for players to start betting right away, Winner have made a lot of deposit methods available. To be exact, there are almost 40 ways you can use to transfer money to your account. All of them can be seen in the table. The usual Bank transfer and credit/debit card options are available (Visa and Mastercard supported), but there plenty other that you can choose. Digital wallets as Neteller and Skrill are supported, and there are no deposit fees no matter which method you use. Minimum deposit fee is £5 or currency equivalent, and minimum withdrawal fee is £20. To withdraw fund from your account, you can use the same method you deposited the money. 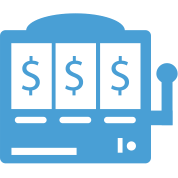 Pending time is usually 24 hours with processing times to up to 4 days, which is average for most bookmakers. The bookie also operates with several currencies which also can be seen in the table. To rank amongst the best bookmakers in the world Winner has made some of the most tempting bonus offers in the industry. For starters, you have the Football Accumulator bonus where you can earn up to 100% on 14 folds and higher. You can place 20 separate in-play bets from a mobile device on any football match at odds greater than 2.00 and earn a free £10 bet. As a welcome Bonus there is 100% on 200GBP which is quite generous offer. Minimum odds of 1.5 and requirement rollover 8 times. Aggressive Casino bonus You have the same offers on tennis games as well. Winner offers Welcome Casino Bonus too – 200% on 100GBP (300 GBP in total) with requirement rollover 35 times.